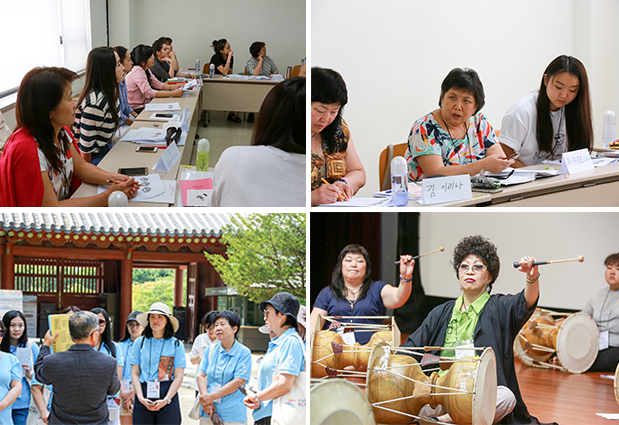 Ewha Language Center (Director Shim So-hee) has successfully run “2018 Training for Korean Teachers Coming from the CIS Region” offered for five weeks from Wednesday, June 13 to Wednesday, July 18, 2018. This training program, organized by Overseas Koreans Foundation and sponsored by ELC, was provided for 28 Korean teachers who are ethnic Koreans coming from four CIS (Commonwealth of Independent States) countries: Russia, Kazakhstan, Uzbekistan, and Ukraine. The program aimed at improving Korean language skills of the Korean teachers and enhancing their understanding of Korean history and culture. In the program, the trainees took Korean classes for their level to improve their Korean, which is their mother tongue, and attended other classes to enhance their teaching skills such as a special lecture “Practice of Korean Language Teaching” tailored for each teaching target and “Micro Learning” where they could experience various teaching materials and methods. In addition, they studied Korean history by visiting various historical sites including Changdeokgung Palace and Jongmyo Shrine, both of which have been listed as World Heritage, the Independence Hall of Korea, the War Memorial of Korea, and Dora Observatory, and felt beautiful nature of Korea in Jeju, a gorgeous island selected as World Natural Heritage. Furthermore, the trainees had opportunities for experiencing Korean culture including folk painting, double-headed drum, and calligraphy to strengthen their identity and a sense of roots as Koreans. Unlike previous years, this year, local training was first given in the CIS region including Moscow and Vladivostok in Russia, Almaty in Kazakhstan, and Tashkent in Uzbekistan, and in the training, a special lecture “Korean Language and Korean Culture Teaching Method” was delivered not only for trainees for 2018 but also those for 2016 and 2017.